The International Union for the Conservation of Nature (IUCN), founded in 1948, is the world’s oldest and largest global environmental organization. With Official Observer Status at the United Nations General Assembly, IUCN is a leading authority on the environment and sustainable development. It serves as a neutral forum for governments, NGOs, scientists, business and local communities to find pragmatic solutions to our most pressing environment and development challenges. More than 1,200 member organizations, including 200+ government and 900+ non-government organizations. Almost 11,000 voluntary scientists and experts drawn from 160 countries, grouped in six Commissions. 1,000 IUCN staff in 45 offices, managing thousands of field projects around the world. One of IUCN’s six scientific Commissions is the Commission on Ecosystem Management (CEM). CEM is a network of about 800 volunteer experts from around the world who work on ecosystem management-related issues. Issues covered include climate change adaptation, fisheries, and ecosystem restoration and services. CEM has 21 Thematic Groups focused on ecosystem types, such as islands and grasslands, or pressing topics of concern, such as fisheries and climate change adaptation. One of these expert bodies is the Mediterranean-Type Ecosystem Thematic Group (MTEG). The members of MTEG are scientists interested in the management and sustainability of Mediterranean-type ecosystems. Its 69 members hail from all five of the world’s Mediterranean-type ecosystem regions. Representatives come from 21 countries: Australia, Canada, Chile, Croatia, Egypt, France, Greece, India, Iraq, Israel, Italy, Lebanon, Morocco, The Netherlands, Nigeria, Portugal, South Africa, Spain, Switzerland, United Kingdom, United States. Provide environmental public outreach programs relevant to Mediterranean-climate regions. Argan trees are native to Mediterranean-climate North Africa. 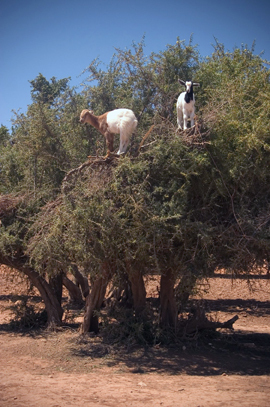 Goats climb the trees to eat the fruit. Argan oil is prized for culinary and cosmetic uses. People traditionally collected the undigested pits, grounding and pressing them to produce the oil. The products of MTEG’s efforts will be significant to a wide spectrum of interests—from researchers to policy-makers, land managers to local residents—throughout the world’s Mediterranean-climate regions. A list of the current year’s projects appears on IUCN’s MTEG website. If you are interested in joining MTEG, please contact the IUCN’s Commission on Ecosystem Management.